At the turn the guys will each put their 45lb plates on the prowler and take over. 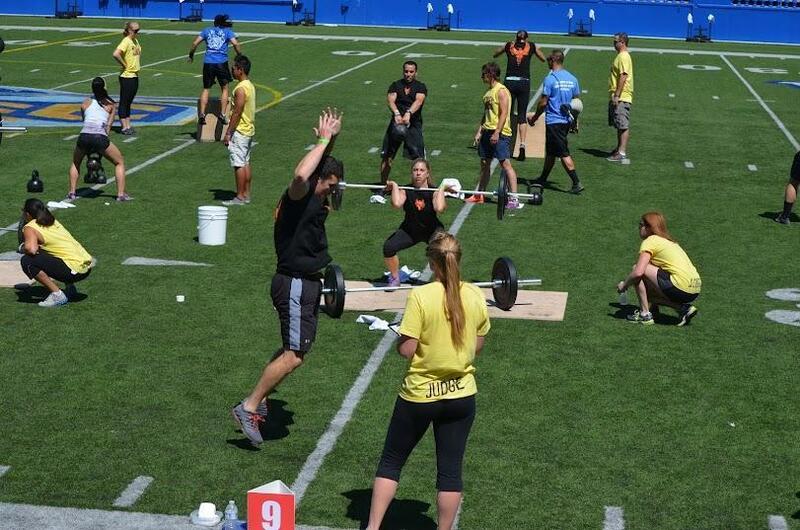 75 Power Snatches @ 65lb ….2 girls, one girl working, switch as often as you want. Cannot switch to next exercise until others are done! When guys have finished double unders and girls have finished power snatches they will switch exercises. 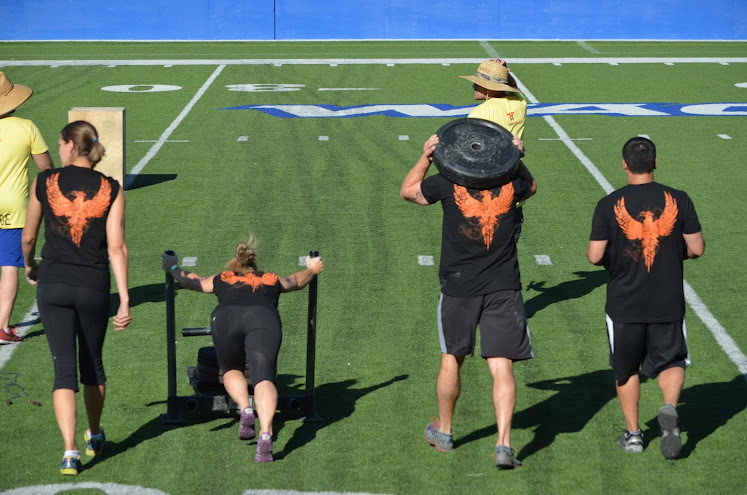 At the turn the guys will each remove their 45lb plates on the prowler and the girls will take over. 4 x 750m row, with a 5 yard sprint from the starting line to the rower. To say that this was a lot of work to cover in 24 hours might be a bit of an understatement; even after the floater WOD – which we completed first – our legs and backs were a little tired and stiff. Jimmy even felt a little twinge during the row, but powered through successfully for the rest of the weekend. The row did, though, act as a nice warm up for the other two workouts we would need to complete that day. We were out on the field at Spartan Stadium – San Jose State’s football field – so it was incredibly hot and bright. It’s quite a different experience working out in the middle of a turf field in the sun instead of indoors, with climate control, firm flooring, and no sun blaring down on you. The nice thing about it was the crowd. Having a couple hundred people cheering you on, music blaring, and a few dozen others competing all at the same time really gets the adrenaline going. The weights seemed “heavy” during the warm ups, but once I heard “3-2-1 Go!” it was just time to start moving and race against the clock. We didn’t have the best scores, but that really wasn’t the point – we all worked hard and got out there to compete! While Danielle is still actively competing in weightlifting, Jimmy plays basketball, and Jenny is an avid triathlete, this was my first time getting the competitive juices flowing in about 2 years (haven’t been able to get back into playing soccer). It was great to feel the excitement and “in the zone” feeling of fighting for a win. 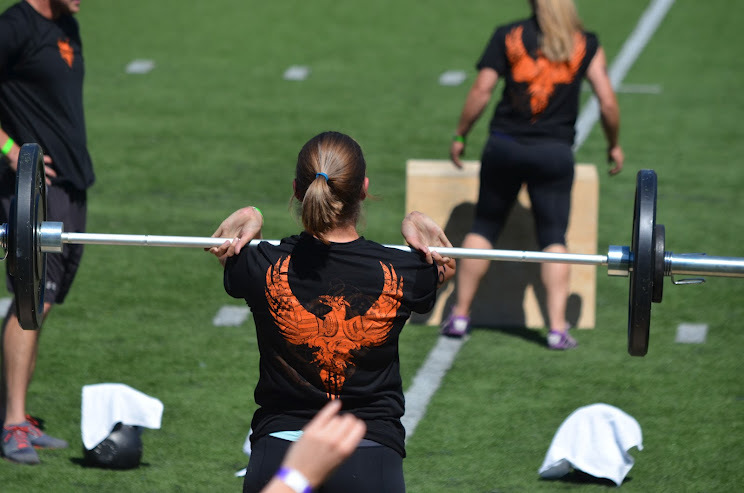 I don’t know about the rest of them, but it really instilled a desire to get back into competing – whether back at soccer, more Crossfit throwdowns, or possibly enter a weightlifting meet (as Rob keeps encouraging). We all workout for different reasons – lose body fat, increase muscle mass, stay “healthy”, relieve stress, and even to fulfill a sense of competition. Whatever the reasons, it is a great feeling, as well as a wonderful exercise in motivation, to step out of one’s comfort zone and try something different (and maybe more difficult than you thought you were capable of). What will your next physical challenge be? This entry was posted in Crossfit, Events, Inspiration, Inspiration, Uncategorized and tagged competition, crossfit, Moxie Madness, workout.